After a solid 7-9 season in 2014 under first year head coach, Mike Pettine, the Browns will look to build off that success when they open up the 2015 season in the Meadowlands against the New York Jets on Sunday. Cleveland had a mediocre free agency period that included the signing of veteran quarterback, Josh McCown, and the departure of Pro Bowl tight end, Jordan Cameron. 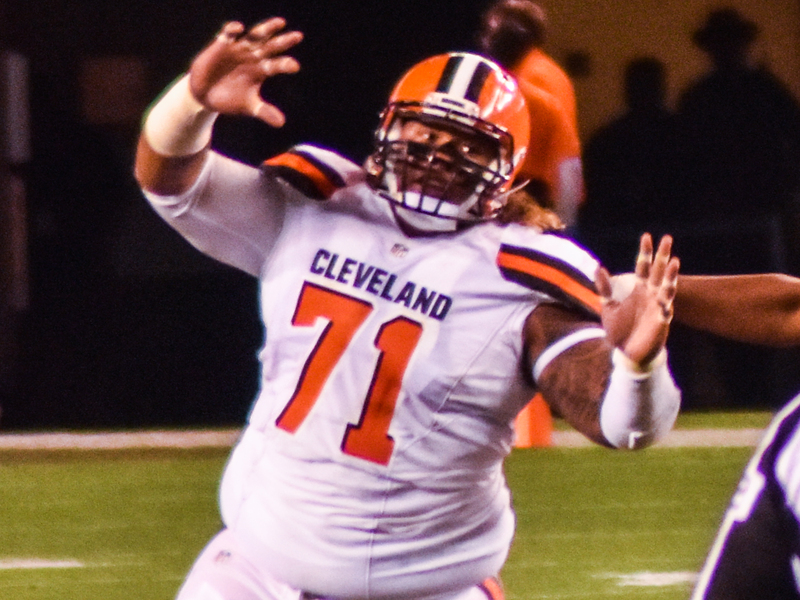 The Browns made up for this with an impressive draft that saw two first round picks in the form of defensive tackle, Danny Shelton, and guard, Cameron Erving. The Browns offense will be a huge question mark this season. For me the main problem is at quarterback. Josh McCown had a decent preseason campaign, but his two best performances came against the struggling Redskins and the lowly Buccaneers. He had a rough outing in week 2 of the preseason against a strong Bills defense that saw him throw for 57 yards and 2 interceptions. Johnny Manziel showed some bright spots in the first two preseason games, but an elbow injury has raised some concern. McCown will have the reigns to open the season, but do not be surprised if Manziel takes over the starting job halfway through the year. Cleveland’s offensive line is one of the best in the league led by eight time Pro Bowler, Joe Thomas. Two time Pro Bowl center, Alex Mack returns after missing the majority of last season with a broken leg. Second year guard, Joel Bitonio has showed a lot of promise and is projected by many NFL experts to be a Pro Bowler this season. First round pick, Cameron Erving should see some playing time this year as he is currently backing up guard, John Greco. Erving will give the Browns options as he can play any position on the offensive line. The Browns also have some questions at the running back position and at wide receiver. Cleveland took a step in the right direction last week by trading second year running back, Terrance West to the Tennessee Titans. West has a great deal of talent, but was inconsistent and had a horrible attitude that caused problems during his time here. For now the Browns will depend on second year back, Isaiah Crowell, and rookie, Duke Johnson. Crowell showed last season that he can be a productive back by rushing for 607 yards. Johnson is a speedy and shifty runner that will create headaches for opposing defenses, but he has already had some injury issues during training camp. Over the last month, rumors swirled about the Browns adding a veteran running back to step in for the young backs. Cleveland finally added a veteran back this week when they claimed Robert Turbin off of waivers from the Seahawks. It was a head scratching move for me because the Browns cut Terrelle Pryor to add a running back that won’t be ready for 2-4 weeks with an ankle injury, but we will get into that more later. For the second year in a row, Cleveland will start their season without top receiver, Josh Gordon. Unlike last season, Gordon is suspended for the entire year after a second substance abuse violation. His absence forced the Browns to add a pair of veteran receivers this offseason in Brian Hartline and Dwayne Bowe. Hartline had a good preseason and has built some chemistry with McCown. Bowe missed the first three preseason games with a hamstring injury and played in the finale at Chicago registering one catch for 8 yards. Bowe’s best may be behind him which means that younger players will have to step up. Andrew Hawkins, Taylor Gabriel, and Travis Benjamin will all get reps in week one. The Browns shocked many earlier this week by waiving Terrelle Pryor. Pryor made the transition from quarterback to receiver this summer with the hopes of keeping his NFL career alive. Like Bowe, Pryor missed the first three preseason games with a injury. Pryor had no receptions against Chicago, but he ran the wildcat offense twice where he kept the ball for a total of nine yards. Despite playing only one preseason game, he made the 53 man roster only to be waived just days later. With time, I saw Pryor growing into a dangerous offensive weapon. He is very fast, can catch the ball, and can throw. With Pryor gone and Gordon suspended, Cleveland will have to rely on a core of receivers that will face adversity this season. 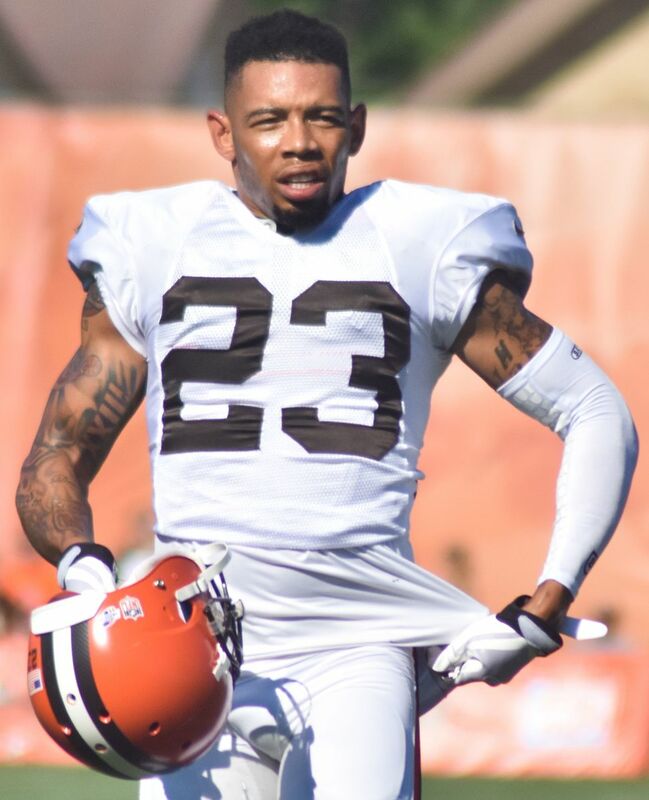 Two-time Pro Bowl Cornerback, Joe Haden. The Browns defense will be the strength of the team this season. Cleveland’s secondary is lead by a core group of veteran players that have each made the Pro Bowl. The two corner backs are longtime Brown, Joe Haden and newcomer, Tramon Williams. The starting safeties are Cleveland native, Donte Whitner, and Tashaun Gipson. 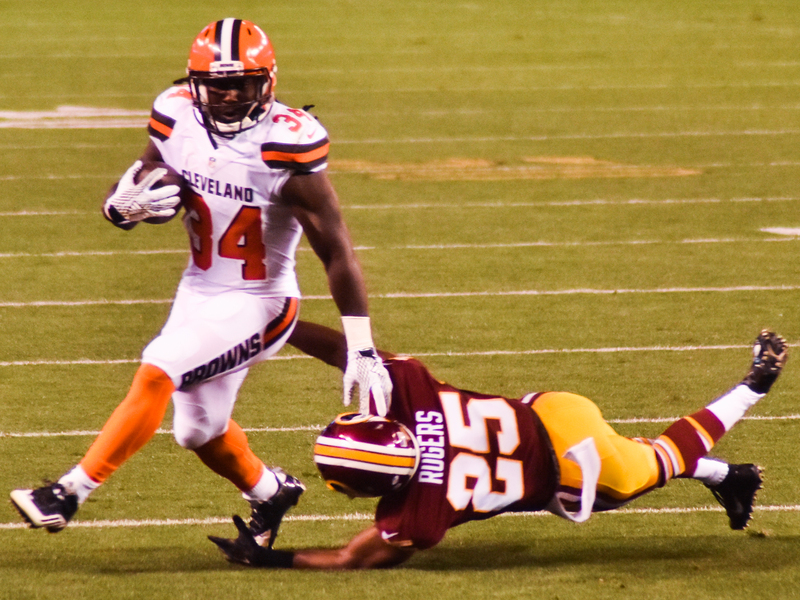 The Browns entered the offseason with high hopes for the eighth overall pick in the 2014 draft, Justin Gilbert, but his troubles have only continued after a disappointing rookie campaign. Gilbert is currently listed as the backup to Joe Haden and after his recent road rage incident his days in Cleveland may be numbered. Cleveland will have a strong rotation of linebackers this season. 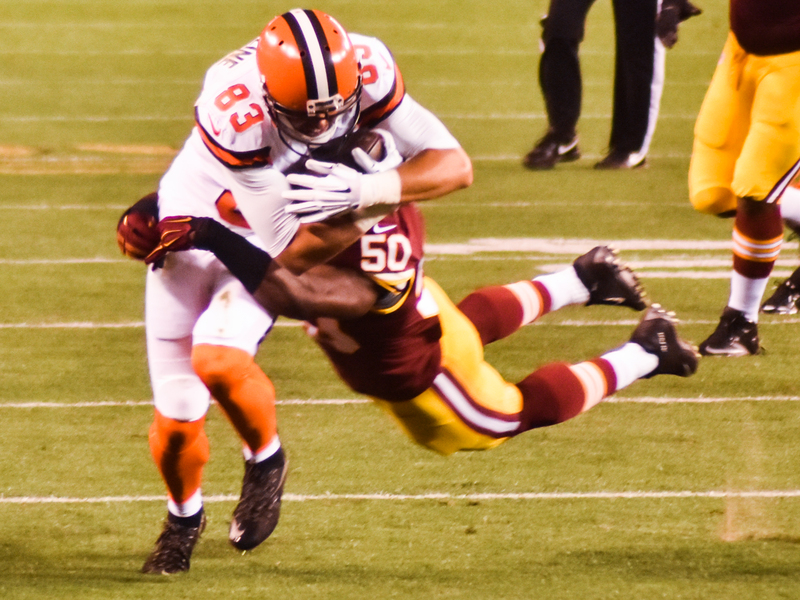 The starters include veterans Paul Kruger and Karlos Dansby, as well as Chris Kirksey and newcomer, Scott Solomon. 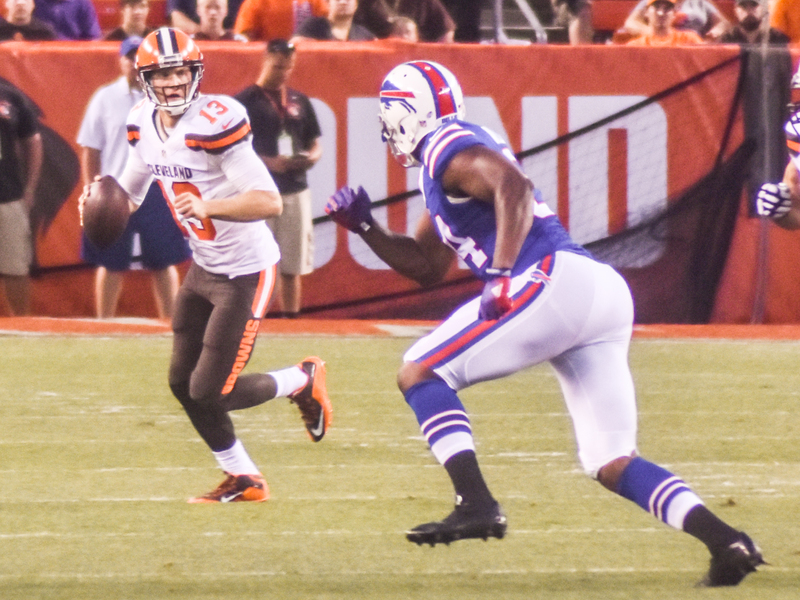 Barkevious Mingo and rookie Nate Orchard should see time in the rotation this season. Mingo has struggled with injuries in his young career, but when healthy he has been the best coverage linebacker on the team. Orchard had an impressive training camp and is an excellent pass rusher. He recorded 18.5 sacks last season as a senior at Utah. Orchard will be a great piece in the Browns defense for years to come. Cleveland’s defensive line was beefed up this offseason and is returning only one starter in Desmond Bryant. Defensive tackle, Ahytba Rubin signed with the Seahawks in free agency and tackle, Phil Taylor, was released in the first wave of this year’s preseason cuts. The Browns also traded 4th year defensive end Billy Winn to the Colts this week. With the departure of three tackles comes the arrival of a defensive monster in the form of Danny Shelton. At 339 pounds, Shelton is excellent at stopping the run and is a space-eater that swallows up blocks. Cleveland native, Jamie Meder, will see time at the other defensive tackle slot. Desmond Bryant will start at left end and newcomer Randy Starks will play at right end. Bryant and Starks should complement each nicely as they are both sack masters. This season will be a make or break year for Coach Pettine and the Browns front office. After a rocky offseason that included textgate, Johnny Manziel’s rehab stint, Justin Gilbert’s attitude issues, and a recent scandal involving an offensive line coach, the Browns must make some improvements on the field. The first half of the Browns schedule is not too bad as it includes games against the Titans and the Rams. The second half of the season will be a challenge for Cleveland as they will face the Broncos and the Seahawks. My bold prediction is that the Browns will go 8-8, missing the postseason for the 13th straight year.